Back in late October, just before Hurricane Sandy hit New York City and my cable/phone/internet service went out for nearly a week (although it’s unclear to me whether the one really brought about the other, but that’s another story), the Dallas Morning News ran my review of two new books by Iain Banks—or, rather, one new novel by Iain Banks and one new novel by Iain M. Banks. For 25 years, you see, Banks has used his middle initial to distinguish his explicit science fiction from his more “literary” efforts…which, in fact, often have genre elements of their own. There’s usually a significant gap between new Banks books, but it just happened to work out that two American publishers each had a novel of his lined up for this fall season. 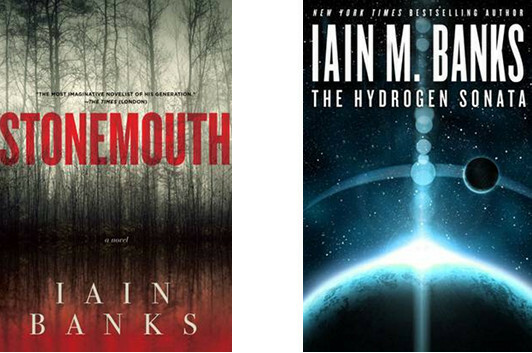 Stonemouth and The Hydrogen Sonata are quite different in scope, but there’s a common psychological ground that makes me feel very comfortable recommending them both—even to readers who “don’t like science fiction.” Banks’s most alien characters are still recognizably human in their behavior, and he has a knack for picking out the strangenesses of the contemporary world. As it happens, I’ve read more Iain Banks than Iain M. Banks to date, but I’m definitely looking to redress that imbalance in the future.